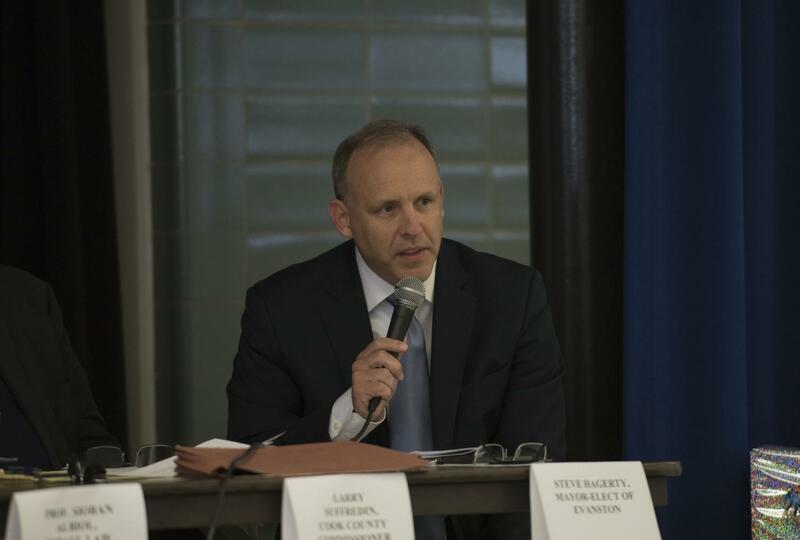 Evanston Mayor Steve Hagerty speaks at a panel. Hagerty joined other mayors Tuesday in signing the Chicago Climate Charter to reaffirm his commitment to fighting climate change. Mayor Steve Hagerty signed the Chicago Climate Charter at a mayoral climate summit Tuesday, but Evanston won’t see much change, city sustainability coordinator Kumar Jensen said. “A lot of the actual specific items within the charter are things that the city is already committed to doing and is already making significant progress on,” Jensen said. The summit brought more than 50 mayors from across North America together to discuss fighting climate change in a nation that plans to withdraw from the Paris Climate Accord. Although President Donald Trump has announced he is pulling the U.S. from the agreement, a formal exit can only take place in 2020. Former President Barack Obama also made an appearance at the summit to speak about fighting climate change under the Trump administration, according to news reports. The charter Hagerty and other mayors signed calls on local governments to show strong leadership to citizens at home and abroad by setting their own standards to reduce emissions. Hagerty committed the city to following the Paris Climate Accord in June, months before the summit. Jensen said Evanston is a leader in making carbon reductions: The city achieved a 19 percent reduction in community-wide emissions from 2014 through the end of 2016, according to the Livability Plan Final Report. This year, Hagerty pledged to join the Sierra Club’s Mayors for 100% Clean Energy initiative to achieve 100 percent clean energy in the city, and he created a working group in August to reach those goals. The Climate Action and Resilience Plan Working Group will lead the city’s third climate action planning process. The group is made up of 16 voting members and a student representative from Evanston Township High School. Members held their first meeting in November to create a plan that reassesses Evanston’s greenhouse gas emissions inventory and evaluates the city’s risks of climate change. “They are starting to move forward for developing a plan for how to actually achieve those goals,” Jensen said.